Wisconsin Governor Scott Walker speaks during the NRA's Celebration of American Values Leadership Forum at the NRA Annual Meetings and Exhibits April 13, 2012 at the Edward Jones Dome in St. Louis, Mo. Normally friendly, Wisconsin has been anything but in the past few months. Statewide, the question of whether to keep Governor Scott Walker or kick him out for slashing collective bargaining for most public employees has set neighbor against neighbor. Three in 10 Wisconsin voters have stopped speaking with someone about politics because of Walker, according to one recent poll. In Chippewa Falls, a woman hit her estranged husband with an SUV when he tried to block her from voting for a Democrat. In two towns near Milwaukee, the governor's campaign signs were set ablaze. None of this was part of Walker's original plan when he assumed the governorship in 2011, but on a personal level, it is paying off nicely. 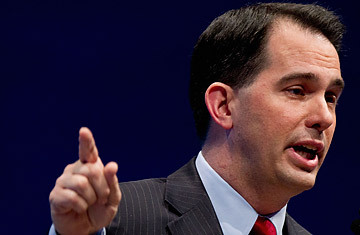 Walker has surfed a controversy of his own making to the center of the national stage. Fellow governors have flocked to Wisconsin to campaign alongside him, lashing their reputations to his. Mitt Romney called him a "hero." In the final days before the June 5 recall election, he has shattered fundraising records, befuddled his opponents and pulled ahead in the polls. The referendum has transformed a rookie governor into a conservative superstar. It's hard to see any of this from Madison, where the anti-Walker hostility is as high as it was 15 months ago, when he muscled a bill through the legislature that increased public employees' obligations toward their pensions and health care costs and stripped them of virtually all their negotiating rights. For weeks, protesters flooded the frozen capitol square, marching laps around the statehouse in the falling snow and huddling on the marble floors of the rotunda. As soon as Wisconsin law permitted, they organized a recall drive that netted nearly 1 million signatures. Every weekday since the bill was signed, opponents have gathered at the capitol at high noon for an hour-long protest. "No matter what happens, this doesn't end here," says Chris Reeder, 41. But while the activists chanted, the governor went to work. He raked in a record $31 million to defend his seat, most of which came from out-of-state donors. Republicans poured that cash into a robust ground game, blanketing the airwaves with ads and making more than 2.5 million phone calls to energize supporters. "They can protest," Wisconsin GOP spokesman Ben Sparks says of Walker's opponents. "They've got us beat on that. But that's about all they've got us beat on." By charging straight at his critics, Wisconsin may actually be moving closer to the Republican column. Having assembled a seamless campaign to defend their imperiled star, party elders hope that his survival could foreshadow Romney's ability to ride a similar coalition of fiscal conservatives, Tea Partyers and heavyweight donors to an upset in the state in November. While Republicans haven't won Wisconsin on the presidential level since 1984, George W. Bush nearly pulled off the feat twice, and Romney is only a step or two behind Barack Obama in recent polls.